Your pain means nothing to me. Pain is subjective. It is highly personal, different for every person. Hospitals have pain charts with number scales and facial expressions as indicators of pain for verbal and nonverbal patients. If you’re intubated (a breathing tube down your throat) you can’t speak. Though uncomfortable, you may or may not be medicated enough to experience pain. You will want a nonverbal pointing chart to tell your doctors to increase or change the meds. When people ask if getting tattoos hurt, I tell them no. Not really. But I know people who found getting their tattoos excruciating. Why? Pain is personal. It is this very subjectivity that confuses people when talking about sCAMs (Complimentary and Alternative Medicine). “Acupuncture took my pain away!” is a frequent anecdotal response. The data is clear – when done in a proper, double blinded study, acupuncture performs no better than placebo or sham acupuncture (twirling randomly placed toothpicks). Someone who practices acupuncture obviously doesn’t understand or care about modern medical practices (or more likely they willingly reject facts). If the practitioner believes in ancient magic (nonscientific), then they don’t necessarily understand or embrace germ theory (scientific). Why risk having them stick needles in your body if you get the same effect with toothpicks? Sit down and write your bio. I’ve read many resumes and thrown out most of them. The people I’ve hired don’t necessarily have all of the paper requirements the job demands but all of their resumes showed that there was an interesting person beyond the page. I’d rather work with someone who is interesting and has a hungry mind than someone who can simply do a particular task really well. Maybe that is my liberal arts bias, maybe it’s that I’m perpetually looking for people who remind me of me. But when I turn the question inward I hobble myself by disallowing internal definitions of success. Active.com is often a good resource for training tips, articles on workouts, diet, and expert opinion. Every now and then it contains garbage, like a factory that processes nuts there can often be a deadly allergen in the product. I don’t self-define as being a skeptic. It’s a loaded term that connects with the skeptical movement that is in itself a response to the lack of critical thinking in this country and the world. I’m an iconoclast. I resist defining myself by association with any particular group because joining with a group often carries with it guilt by association. I am a critical thinker and I apply critical thinking to everything that I do. Today I watched a truck roll into an intersection and slam into a kid on a bike. The kid wasn’t wearing a helmet and is lucky only his bike was run over by the car. The kid rolled into the pedestrian crosswalk and had right of way as a pedestrian. The truck overshot the intersection. The kid was very lucky he didn’t die. My cousin Chris invited me to join him in the Long Beach Urban Fitness Challenge. For several months he’d been doing plyometrics workouts on the beach with a coach who is very good at destroying people. Chris had recently been upgraded to push-ups with a handclap behind the back, working towards pushups with a backwards, then forwards handclap on reach rep as part of his routine. Stomach crunches until puking, wind sprints, “muscle confusion”, that sort of thing. It really worked for him and he was part of my motivation to include weights and resistance training into my weekly plan. When Chris signed me up as his “Ironman friend”, I felt the implied challenge and immediately fretted about what I had just signed up for. Weight, Weight, Don’t Tell Me. Several years ago I had a notion that it would be fun to be ripped just once in my life. I thought that doing an Ironman would result in that idealized body but instead I transformed into the triathlete frame – a door. Flat and narrow front and back, square and boxy shoulders to hips. I got my body fat to just under 10% and I felt great about myself. Six months after my Ironman and I feel as though I’ve become a whale. I’m only eight pounds heavier than my Ironman weight but I’m certainly a higher fat percentage. Body composition is much more important than the numbers on the scale – what is making up the mass is much more important than the mass itself and presently it feels as though my mass is made up of several bars of Plugra. My father’s ashes had been sitting on the shelf for several weeks when I got an email from Tim B. saying that surf conditions would be low along with warmer water temps. I invited several friends to join me at 8am in Santa Monica to swim out to the buoy and scatter my father’s remains into the sea. Steve, one of the founders of the Ocean 101 crew, volunteered to paddle his surfboard out to the buoy and ferry my dad with him. Steve became the pallbearer, or Charon if you like that image. We met at the parking lot and made our way to the ocean. Sofia and Eve walked with us, opting to sit on the beach and observe as we did our service. Sofia was finally on hiatus from finishing her master’s thesis waiting for rewrite notes and her first draft delivery was marked by the news that one of her cousins, the first cousin of her mother’s very large family, had just died at age 47 leaving behind a wife and 10 year old son. 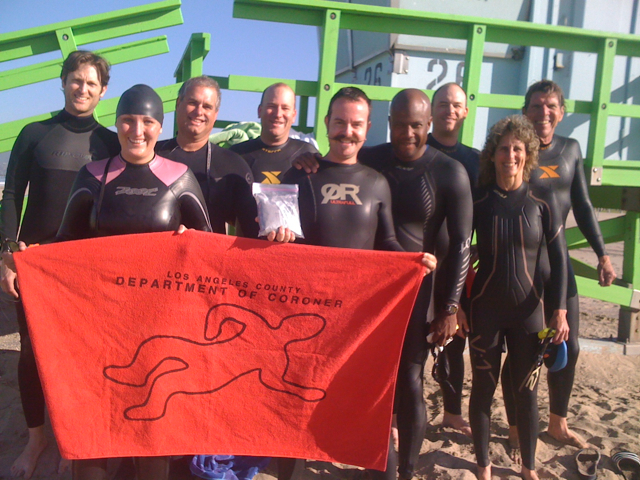 Our memorial crew stood in front of the lifeguard station and Sofia took our picture with us holding up a beach towel from the L.A. County Coroner’s Office, the body outline a joke my father would have loved.